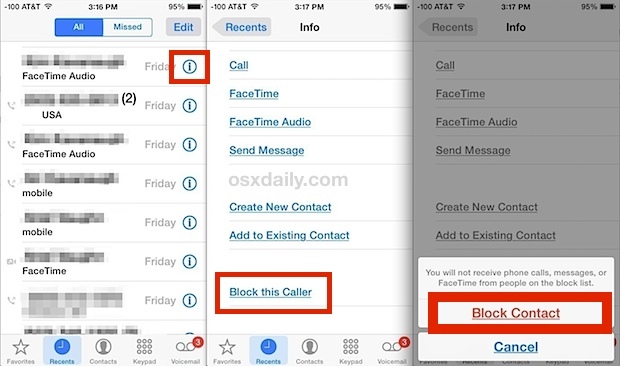 You can block callers from contacting you on your iPhone, and not only will it block their inbound phone calls but also any text messages or FaceTime communication attempts. This is obviously useful for so many reasons, whether it’s to avoid a nuisance or a weirdo, and it’s simple to use. One interesting thing to note about how iOS blocks callers is that it actually just sends the caller / contact to a voicemail box that doesn’t exist, and likewise their attempts at sending texts and FaceTime attempts just go into a void, regardless they don’t get any acknowledgement of being blocked by you the user. It’s as if they’re reaching out to a black hole of /dev/null and they don’t even know it, which for most purposes is perfect. 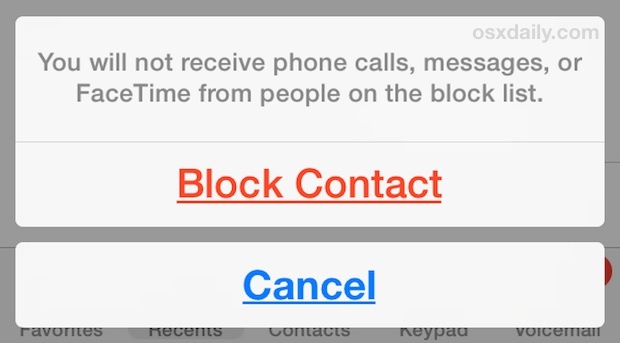 If you’re unfamiliar with the blocking feature built into iOS, here’s how to use it. This adds the phone number or full contact card to the block list of iOS, preventing all phone calls, text messages, iMessages, and FaceTime attempts from that users phone number, email, and/or Apple ID. This really is all encompassing, which makes it not only very thorough but also fairly powerful if you’re really wanting to avoid a particular individual. As already mentioned, there is no confirmation sent to the blocked individual that they have been blocked by you, from their perspective the call rings and messages are sent, they just don’t go anywhere, it’s as if the contact attempts are being ignored. Many users should find this helpful, especially if your iphone’s phone number was previously owned by someone else, or if your number has been added to some nuisance list of marketers, persistent spammers, or another contact list that pesters you constantly. Sure, you can just ignore the call by muting the ringer to silence it or sending the call right to voicemail, but actually blocking the contact works much better, especially since it reaches beyond the Phone app and will also prevent initiation attempts through FaceTime voice and video chat as well as SMS text and iMessaging attempts. Note with the latter two connection attempts, the block will carry over to your other iCloud based services using the same Apple ID, meaning a blocked contact on the iPhone will also block that contact from messaging your Mac or iPad. There are other ways to add contacts to the blocked list, but this is the simplest method. You can also do it through the Contacts app, FaceTime app, or Messages by finding the contact, getting info on them, and choosing the same “Block Contact” option. And of course if you decide you want to unblock a caller, you can quickly do that too. 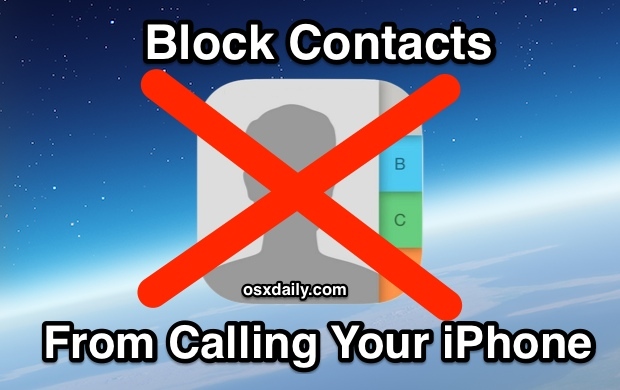 The ability to directly block contacts was added as part of the major 7.0 overhaul of iOS, users running prior versions of iOS will need to use an old fashioned method of basically creating a silent contact as a block list, very much a workaround, but it does work if you’re looking to ignore someone at least. For those on the desktop, Mac users can also choose to block specific iMessage users directly in OS X through the app. And if you have a Contact named Ignore This Call, with a Silent Ringtone, you can add as many phone numbers as you need to the list, and never be bothered by these telemarketers and nuisance callers ever again! Please show which versions of IOS have this feature. I have an iPhone 5 with IOS 6 and do not want to “update” to IOS 7. My recent calls page does not have the “i” symbol. I just recently discovered that blocked numbers ARE actually able to leave a voicemail on my phone (5s / 7.1.1 / AT&T). In ‘Visual Voicemail’ on the phone there’s now a “Blocked Messages” category. Yes, that’s a contradiction — not to mention a lame, partial-solution. The ‘Visual Voicemail’ system is fraught with dysfunction anyway, with no sign of a fix from AT&T, leaving millions of customers with crippled voicemail. This is what you get from a company that embraces mediocrity as a business model. Imagine a world where AT&T, Verizon and Motorola still controlled the design and manufacturing of cell phones — the situation until Jobs somehow convinced AT&T to sell a non-existent product, the design and engineering of which they would be granted absolutely zero input. We’d probably have Android by now — maybe — but it would be lamer than it already is. For obvious reasons, of course. Let the irrational Apple-hatred slobbering begin. I can not figure this out. I have blocked a number a week ago. Yesterday i recieved a forwarded picture text from that same number. I then checked my settings under phone/blocked. Indeed the caller is blocked with the message reading: you will not recieve phone calls messages FaceTime from people on the blocked list. How is this possible? the statement ” One interesting thing to note about how iOS blocks callers is that it actually just sends the caller / contact to a voicemail box that doesn’t exist, ” has never been true on my iphone 5c, or with carrier. Maybe something to do with carrier? The blocked messages list is at the bottom of the voicemail list. you click on that and you can see the voicemails and even listen to the blocked voicemails. This is the answer I was looking for, how to stop a blocked contact from leaving a voicemail. So far, no answer for that problem and it is a problem for me. I have my ex blocked and I have had to delete anywhere from 20 to 50 blocked messages a day. I blocked her because she was really harrassing me, but her being able to actually leave a voicemail also amounts to harrassment. This is the problem I was trying to solve. I have set up spam numbers in my contacts and checked the “block contact”. Since the latest upgrade, this no longer works, my calls ring through. Why is this? I used to be able to reject the call and since installing IOS9 I am not give this option either. Lots of problems with this upgrade. Has anyone found the solution the blocked calls at the bottom of the voicemails? I have recently discovered that there are numbers I can’t block at all. Uh e been bombarded with political text messages and no matter what I do, I can’t block the number. When I go to the call I go and choose “block caller” nothing happens! I don’t know what to do to stop it. I can’t reply to the text, and when I can, my demands to stop texting me are ignored! Any ideas?